It’s crazy how our mind can formulate chain reaction thoughts. You see or hear something and soon your subconscious has started you on a journey. One thought leads to another and before you know it two completely unconnected ideas have dropped you off at a place you haven’t been for a while. That happened yesterday at our personal property auction. 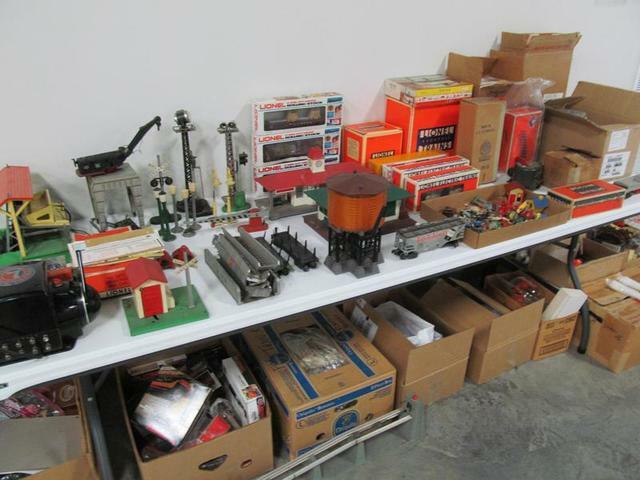 I stood for an hour and clerked the sales of old Lionel and American Flyer railroad items. There were numerous engines, cars, and tracks, along with an assortment of accessories such as street lamps and miniature trees. As I typed the description of a small railway station sporting tiny signs and benches, my mind started a journey into the past. I was a little girl again sitting in a line of chairs at Kearny Gospel Chapel where we were singing a Sunday School song, We’re Going to a Mansion on the Happy Day Express. This childish song spoke of a train headed to heaven where all would be happy. The letters on the engine spelled J-E-S-U-S because believing in God’s Son, Jesus Christ, is the only way to enter the train. As the guard called ALL FOR HEAVEN, we children gladly answered YES! Such a funny song, but such a real desire. The Lord Himself truly is coming back someday for those who belong to Him. He will not be coming on a train, but will come down from heaven on the clouds. There will be the loud shout of an archangel accompanied by the trumpet of God, which will summon all those who have died knowing Christ as Savior. They will rise from the dead first. Then those of us believers in Jesus who are left will be caught up with them in the clouds to meet the Lord in the air, and from then on we will forever be with the Lord. How encouraging these thoughts are as here on earth our longings for perfection are never realized. All that is wrong in the world can be too much to handle sometimes. But someday all things will be made right and, for those who know Jesus as their Lord and Savior, it truly will be a happy day. The auctioneer’s final call jogged me out of the past and back down to earth. I typed the price and bidder number for the little railroad station. Someone will enjoy these novelty toys, but the way to a mansion in the sky is not on the Happy Day Express. It is only through Jesus – no one gets to the Father but through Him. I have to admit, though, seeing all those railroad accessories yesterday triggered chain reaction thoughts that led my mind to a better place, and I can’t wait to get there! Make sure when you hear the angel’s voice and the trumpet of God you are trusting in Jesus. Then we can all respond to the call, ALL FOR HEAVEN, with the glad answer YES! Want to go to heaven? Accept God’s Free Gift.